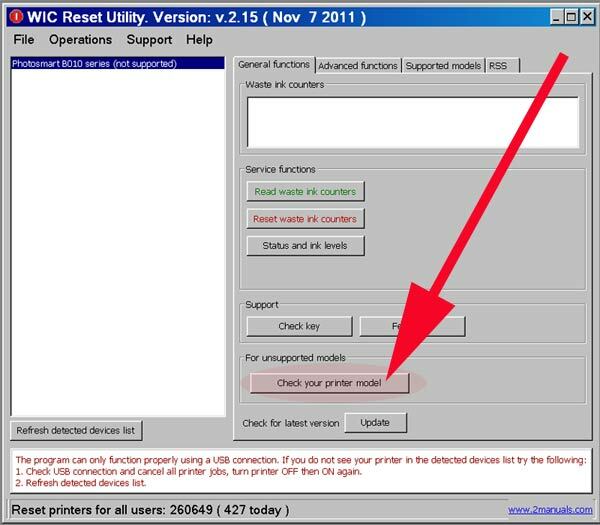 Where possible, when new printers models are released we will purchase, test and update compatibility with the WICReset and iWIC (Mac) utilities. However some printer models are only available in countries that we cannot purchase from, so we need customer help. help us add support in return for a Free WICReset key. 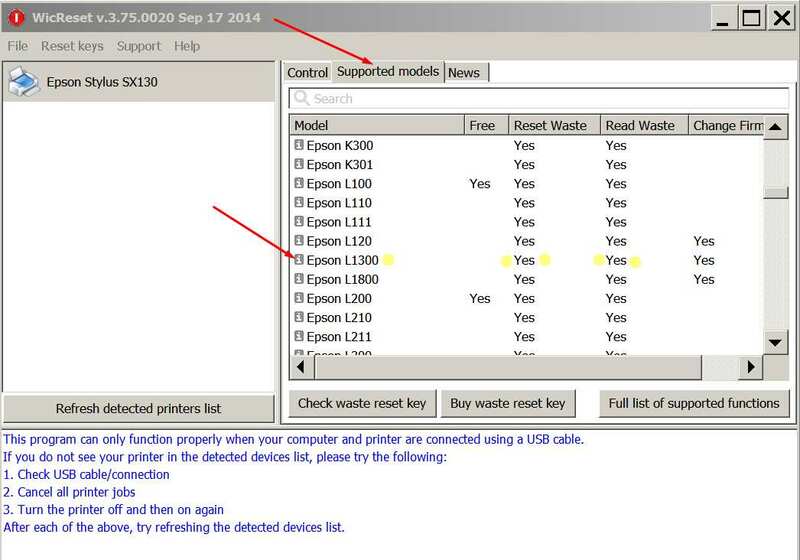 After we get success report for your printer model - we'll give you one Reset Key for testing. GIVE YOU ONE MORE FREE RESET KEY for future (or you can use it on other printer). 1. Run the WIC Reset Utility. 2. Connect the Epson printer to PC by proper USB cable. 3. Click on the Check Your Printer Model button. 4. Check the Testing advanced command set in the Options tab. 5. Click on RUN button in General tab. 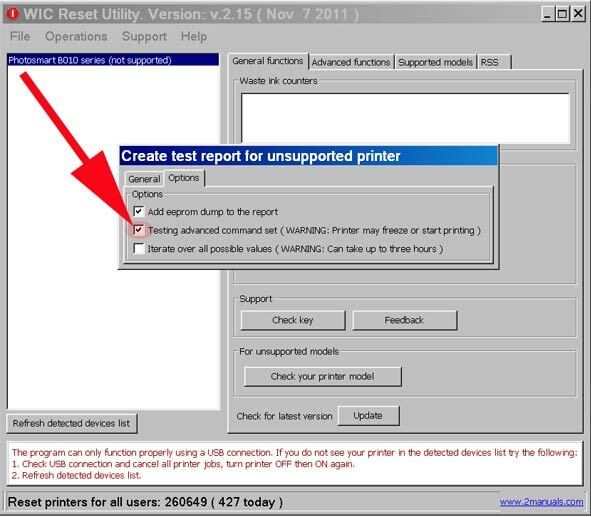 The WIC Reset Utility will create the report and give the information if your printer model can be supported. Please contact us after making report. Artisan 1430 model is currently supported model. So, You can not get free reset key. You can buy Reset key and reset Epson Artisan 1430 waste ink counters in few clicks. Is there a free reset key for my printer Epson ME320.If so please help me by giving instruction to reset my printer. You state this model is supported but I keep getting an error so my problem is not resolved. 1. Check USB connection and cancel all printer jobs, turn printer OFF then ON again. 2. Refresh detected devices list. Reset started. Do not turn off the printer. IEEE 1284 protocol :: response received from printer not matched to an outstanding command. IEEE 1284 protocol :: could not grant credit to the printer channel. Could not write value to printer eeprom. Device communication error. Please restart the device and try the requested operation again. If the problem persists, follow these steps: close all other applications that may communicate with the printer, cancel all current print jobs and replace the usb printer cable. If none of these actions led to the desired result, please, report us as much information about the problem as possible. I want to try this first before I make the purchase. sir may i have the honor to know the reset key of epson L100?thank you. Is there a free reset key for my printer Epson L110.please help me by giving instruction to reset my printer.thank you so much and god bless.. I use Epson Expression XP 30, it seems your programm recognizes it. How does the key work? I i buy the key, can i use it only once to reset a cartridge? "Testing completed. Could not gather any useful information about device. Report is aborted." May I request for a free reset key? I need a reset key for my printer XP 800. How can I download it and at what price? please tell me how can i get epson l200 reset key? Can I get a free key, WIC Reset Utility. Version: v.2.09, I have an Epson Stylus TX117 ? Or one trial before buying ? how ken i get free reset key for my epson l200 pls help! IS EPSON L1300 KEY CODE AVAILABLE? 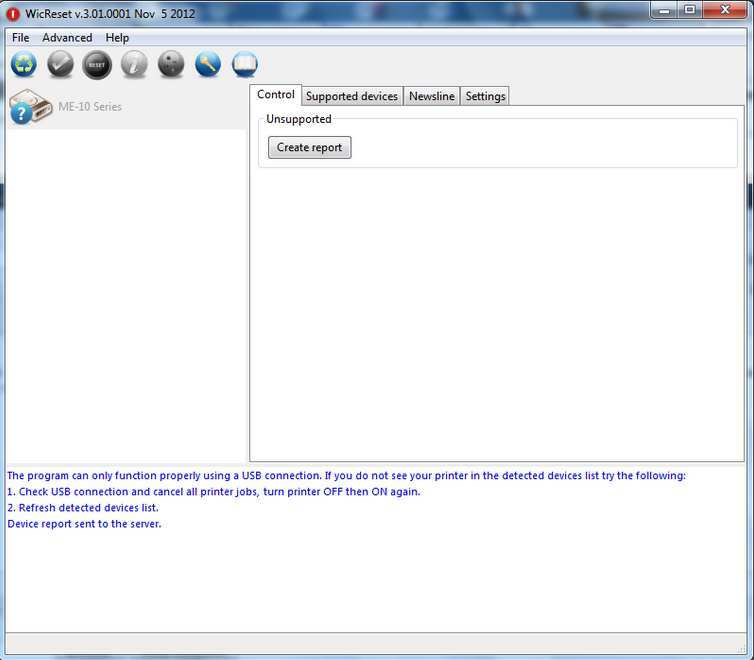 Epson L1300 is supported by WIC Reset Utility. Hi, I tried send the report from WicReset for unsuported model Epson Stylus CX6900F but the software says "Testing completed. Could no gather any useful information about device. Report is aborted"
WicReset is able to detect the printer because it shows the brand and model. Any other way to get it work?